Retweeted by President Trump March 17th. The truth is, that a foreign government did indeed meddle in the American Presidential election, in a failed attempt to fix the outcome, but it was not Russia. It was the City of London, and the Five Eyes imperial intelligence services of the British Commonwealth, along with treasonous, “Tory” American elements. If that admission is forced to the surface, through the vigorous actions of all that oppose the presently dominant Big Lie tyranny, that revelation will shock and liberate people all over the world. The mental stranglehold of “fake news” media outlets can be permanently broken. That is the task of the next days and weeks. The world is actually on the verge of ending the military conflicts among the major world powers, such as Russia, China, the United States, and India. These four powers, and not the City of London, are the key fulcrum around which a new era in humanity’s future will be decided. A new monetary and credit system brought into being through these four powers would foster the greatest physical economic growth in the history of humanity. In addition, discussions involving Italy working with China on the industrialization of the African continent (discussions which could soon also involve the United States) show that sections of Europe want to join China’s Belt and Road Initiative (BRI) and leave the dying trans-Atlantic financial empire behind. “Between Russia, China, and us, we’re all making hundreds of billions of dollars worth of weapons, including nuclear, which is ridiculous. I think it’s much better if we all got together and didn’t make these weapons… those three countries I think can come together and stop the spending and spend on things that are more productive toward long-term peace.” This is a statement of real importance. Such an outlook is a rejection of the “perpetual crisis/perpetual war” outlook of the Bush-Obama Administration, a four-term “war presidency” which was abruptly, unexpectedly ended in 2016. The British were not amused. It is to stop this new cultural paradigm, pivoted on the Pacific and the potential Four Powers alliance, that British imperial forces have deployed. The 2016 election of President Trump, and his personal friendship with President Xi Jinping and desire to work with President Putin, are an intolerable strategic threat to the eighteenth-century geopolitics of the British empire. They have repeatedly used Russiagate to disrupt the process of deliberation among Presidents Xi, Trump, and Putin, thus increasing the danger of war. Russiagate, in the interest of international security, must be ended by exposing it for the utter fraud that it is. President Donald Trump has no vested interest in protecting the British “special relationship.” From his second day in office, Trump declared that he would clean out the intelligence agencies. If Trump were to do that, however, the real, tragic history of America's last 50 years would be exhumed from that swamp. Shining a light into that darkness would illuminate the world. The American people would stop playing Othello to the City of London’s Iago. They would denounce the British “special relationship,” never again to fight imperial wars for the greater glory of the British Empire. They would learn the true story of Vietnam, of Iraq 1991 and Iraq 2003, of Libya 2011, and many other conflicts, special operations, and assassinations. The American people would know the truth, and the truth would set them free. While Robert Mueller found that there was “no collusion” between Donald Trump or the Trump Campaign and Russia, he also filed two indictments regarding alleged Russian interference in the 2016 election. The first alleges that 12 members of Russian Military Intelligence hacked the DNC and John Podesta and delivered the purloined files to WikiLeaks for strategic publication before the July 2016 Democratic National Convention and in October 2016, one month before the election. The second indictment charges the Internet Research Agency, a Russian internet merchandising and marketing firm, with running social media campaigns in the U.S. in 2016 designed to impact the election. When the fuller version of the Mueller report becomes public, it is certain to recharge the claims of Russian interference based on the so-called background “evidence” supporting these indictments. The good news, however, is that investigations in the United States and Britain, have unearthed significant contrary evidence exposing British Intelligence, NATO, and, to a lesser extent, Ukraine, as the actual foreign actors in the 2016 U.S. presidential election. We provide a short summary of the main aspects of that evidence to spark further investigations of the British intelligence networks, entities, and methods at issue, internationally. More detailed accounts concerning specific aspects of what we recite here can be found on our website. The Veterans Intelligence Professionals for Sanity, an association of former U.S. intelligence officials, have demonstrated that the Russian hack of the DNC alleged by Robert Mueller, was more likely an internal leak, rather than a hack conducted over the internet. William Binney, who conducted the main investigations for the VIPS, spent 30 years at the National Security Agency, becoming Technical Director. He designed the sorts of NSA programs that would detect a Russian hack if one occurred. Binney conducted an actual forensic examination of the DNC files released by WikiLeaks, and the related files circulated by the persona Guccifer 2.0, who Robert Mueller claims is a GRU creation. Binney has demonstrated that the calculated transfer speeds and metadata characteristics of these files are consistent with downloading to a thumb drive or storage device rather than an internet-based hack. This supports the account by WikiLeaks of how it obtained the files. According to WikiLeaks and former Ambassador Craig Murray, they were obtained from a person who was not a Russian state actor of any kind, in Washington, D.C. WikiLeaks offered to tell the Justice Department all about this, and actual negotiations to this effect were proceeding in early 2017, when Senator Mark Warner and FBI Director James Comey acted to sabotage and end the negotiations. Further, as opposed to the hyperbole in the media and in Robert Mueller’s indictment, analysis of the Internet Research Agency’s alleged “weaponization” of Facebook in 2016 involved a paltry total of $46,000 in Facebook ads and $4,700 spent on Google platforms. In an election in which the major campaigns spend tens of thousands of dollars every day on these platforms, whatever the IRA thought it was doing in its amateurish and juvenile memes and tropes was like throwing a stone in the ocean. Most of these activities occurred after the election and never mentioned either candidate. The interpretation that these ads were designed to draw clicks and website traffic, rather than influence the election, must be considered. The “evidence” for Mueller’s GRU hacking indictment was provided, in part, by CrowdStrike, the DNC vendor that originated the claims that the Russians had hacked that entity. CrowdStrike is closely associated with the Atlantic Council’s Digital Research Lab (DRL), an operation jointly funded by NATO’s Strategic Communications Center and the U.S. State Department, to counter Russian “hybrid warfare.” CrowdStrike has been caught more than once falsely attributing hacks to the Russians and the Atlantic Council’s DRL is a font of anti-Russian intelligence operations. According to CIA Director John Brennan’s Congressional testimony, the British began complaining loudly about candidate Trump and Russia in late 2015. Brennan’s statements were echoed in articles in The Guardian. According to Brennan, intelligence leads about Trump and Russia had been forwarded to Brennan from both British intelligence and from Estonia. The former head of the Russia Desk for MI6 and protégé of Sir Richard Dearlove, Christopher Steele, fresh from working for British Intelligence, the FBI, and U.S. State Department in the 2014 Ukraine coup, assembled in 2016 a phony dossier called Operation Charlemagne, claiming widespread Russian interference in European elections, including in the Brexit vote. By the spring of 2016, Steele was contributing to a British/U.S. intelligence task force on the Trump Campaign which had been convened at CIA headquarters under John Brennan’s direction. This task force targeted Trump campaign volunteers Carter Page and George Papadopoulos in entrapment operations on British soil, using British agents, during the spring and summer of 2016. The personnel employed in these operations all had multiple connections to the British firm Hakluyt, to Steele’s firm Orbis, and to the British military’s Integrity Initiative. Sometime in the summer of 2016, Robert Hannigan, then head of GCHQ, flew to Washington to brief John Brennan personally. Hannigan abruptly resigned from GCHQ shortly after the election, sparking widespread speculation that the British were making an attempt at damage control. Michael Flynn and Paul Manafort were already on the radar and under investigation by the same British, Dearlove-centered intelligence network and by Christopher Steele specifically. Flynn had been defamed by Dearlove and Stefan Halper, as a possible Russian agent way back in 2014 because he spoke to Russian researcher Svetlana Lokhova at a dinner sponsored by Dearlove’s Cambridge Security Forum. Or, at least that was the pretext for the targeting of Flynn, who otherwise defied British intelligence by exposing Western support for terrorist operations in Syria and sought a collaborative relationship with Russia to counter ISIS. Manafort was under FBI investigation throughout 2014 and 2015, largely in retaliation for his role in steering the Party of the Regions to political power in Ukraine. In 2016, the Manafort investigation migrated to the Democratic National Committee with direct assistance provided by Ukrainian state intelligence. This effort was led by Alexandra Chalupa, an admirer of Stepan Bandera and other heroes of Nazi history in Ukraine. Chalupa also had deep connections to British-oriented networks at the U.S. State Department. In or around June 2016, Christopher Steele began writing his dirty and bogus dossier about Trump and Russia. This is the dossier which claimed that Trump was compromised by Putin and that Putin was coordinating with Trump in the 2016 election. 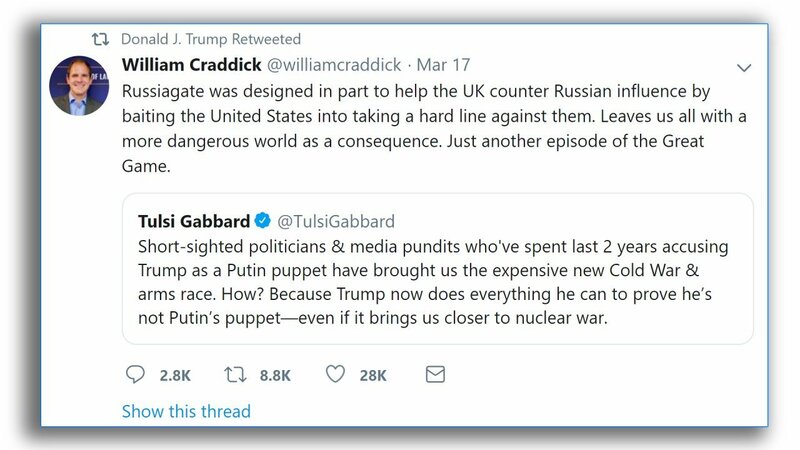 The main “legend” of this full-spectrum information warfare operation run from Britain, was that Donald Trump was receiving “dirt” on Hillary Clinton from Russia. The operations targeting Page and Papadopoulos consisted of multiple attempts to plant fabricated evidence on them which would reflect what Steele himself was fabricating in the dirty dossier. At the very same time, the infamous June 2016 meeting at Trump Tower was being set up. That meeting involved the Russian lawyer Natalia Veselnitskaya, who, it was alleged in a series of bizarre emails written by British publicist Ron Goldstone to set up the meeting, could deliver “dirt” on Hillary Clinton direct from the Russian government. Veselnitskaya didn’t deliver any such dirt. But the entire operation was being monitored by State Department intelligence agent Kyle Parker, an expert on Russia. Parker’s emails reveal deep ties to the highest levels of British intelligence and much chatter between them about Trump and Russia. A now-changed version of the website for Christopher Steele’s firm, Orbis, trumpeted an expertise in information warfare operations, and the networks in which Steele runs are deeply integrated into the British military’s Integrity Initiative. The Integrity Initiative is a rapid response propaganda operation using major journalists in the United States and Europe to carry out targeted defamation campaigns. Its central charge, according to documents posted by the hacking group Anonymous, is selling the United States and Western Europe on the immediate need for regime change in Russia, even if that involves war. Much has been made by Republicans and other lunkheads in the U.S. Congress of Steele’s contacts with Russians for his dossier. They claim that such contacts resulted in a Russian disinformation operation being run through the duped Christopher Steele. Nothing could be further from the truth. On its face, Steele’s dossier would immediately be recognized as a complete fabrication by any competent intelligence analyst. He cites some 32 sources inside the Russian government for his fabricated claims about Trump. What they allegedly told him is specific enough in time and content to identify them. To believe that the dossier is true or that actual Russians contributed to it, you must also believe that that the British government was willing to roll up this entire network, exposing them, since the intention was for the dossier’s wild claims to be published as widely as possible. By all accounts, Britain and the United States together do not have 32 highly placed sources inside the Russian government, nor would they ever make them public in this way or with this very sloppy tradecraft. Steele’s fabrication also uses aspects of readily available public information, such as the sale of 19% of the energy company Rosneft, (the alleged bribe offered to Carter Page for lifting sanctions) to concoct a fictional narrative of high crimes and misdemeanors. Other claims in the dossier were published, publicly, in various Ukrainian publications. The famous claim that Trump directed prostitutes to urinate on a bed once slept upon by Barack Obama seems to be plagiarized from similarly fake 2009 British propaganda stories about Silvio Berlusconi spending the night with a prostitute in a hotel room in Rome, “defiling” Putin’s bed. According to various sources in the United States, this outrageous claim was made by Sergei Millian. George Papadopoulos has stated that he believes Millian is an FBI informant, recounting in his book how a friend of Millian’s blurted this out when Millian, Papadopoulos and the friend were having coffee. The final nail in this case has been provided by The Hill’s John Solomon. He says that Steele told former Associate Attorney General Bruce Ohr about the sources for the dirty dossier. According to Solomon, Ohr’s notes reveal one main source, a former senior Russian intelligence official living in the United States. But, as anyone familiar with the territory would know, there is no such retired senior Russian intelligence official living in the United States whose entire life is not controlled by the CIA. Despite its obvious fake pedigree, Steele’s dossier was laundered into the Justice Department repeatedly, by the CIA and State Department and the Obama White House. It was used to obtain FISA surveillance warrants turning key members of the Trump Campaign into walking microphones. It was circulated endlessly by the Clinton Campaign to a network of reporters in the U.S. known to serve as scribes for the intelligence community. John Brennan used it to conduct a special emergency briefing of the leading members of the U.S. Congress charged with intelligence responsibilities in August of 2016 and to brief Harry Reid, who was Senate Majority Leader at the time. All of this activity meant that the salacious accusation that Trump was a Putin pawn and the FBI was investigating the matter, leaked out and was used by the Clinton Campaign to defame Trump for its electoral advantage. When Trump won, Steele’s nonsense received the stamp of the U.S. intelligence community and official currency in the campaign to take out the President. As a result of Congressional investigations of Russiagate, it has become abundantly clear that the British operation against Trump was aided and abetted by the Obama White House, the State Department, the CIA, the FBI, and personalities associated with the National Endowment for Democracy. The individuals involved might be named Veterans of the 2014 Ukrainian Coup, since all of them also worked on this operation. It is no accident that Victoria Nuland, the case agent for the Ukraine coup, played a major role in bolstering Steele’s credentials for the purpose of selling his dirty dossier to the media and to the Justice Department. This went so far as Steele giving a full scale briefing on his fabricated dossier at the State Department in October 2016. Out of the Ukraine coup, an entire military-centered propaganda apparatus arose, first through NATO, and then out from there to military units and diplomatic centers in the U.S., Europe, and Britain, to run low intensity operations, and black propaganda, against Russia. The British end of the operation includes the Integrity Initiative, the 77th Brigade, and NATO’s Strategic Communications Center. In the United States, the Integrity Initiative has been integrated into the Global Engagement Center at the U.S. State Department. Most certainly, this operation is poised again to intervene in the U.S. elections; the British House of Lords have stated explicitly, in their December 2018 report, British Foreign Policy in a Shifting World Order, that Donald Trump must not be re-elected. This is why the British are yelping that under no circumstances can the classified documents concerning their role in the attempted coup against Donald Trump be declassified. It would end their leverage over the United States and much of Europe. That is why these documents must indeed be declassified, and parallel investigations by citizens and government officials concerned with ending the imperial system, otherwise known as the current “war party,” must begin in earnest.